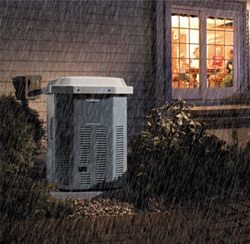 For those homeowners relying on standby propane generators during strong storms for heating, cooking, and power needs, the Propane Education & Research Council (PERC) offers reminders on safely preparing for, and recovering from strong summer storms. Since generators can produce high levels of carbon monoxide, never use a generator indoors or in enclosed or partially-enclosed spaces. They should always remain outdoors. Keep the generator away from the house and entry points (e.g., windows, vents) on a level, dry surface, protected from weather, dirt, and debris. Know how you plan to use your generator and hook up the power accordingly. A heavy-duty, outdoor-rated extension cord is appropriate to power 1-2 appliances or a few lights. Make sure the cord is free of cuts and tears and that its plug has three prongs and a grounding pin. If you want to power appliances that cannot be unplugged from your home’s electrical circuits, such as a furnace, or if you want the generator to run all of your lights, then you will need a transfer, or bypass, switch. Transfer switches should always be installed by a licensed electrician. Hire a licensed plumber or pipefitter to install the gas connections for a propane-powered generator. Never plug the generator into a house wall outlet in an attempt to power the house or you could be electrocuted. Consider purchasing a generator with a low-fuel shutdown to protect your generator if the fuel drops below a safe operating level. Before refueling, shut off the generator and let it cool down. More than 50 million Americans choose propane as their safe and reliable energy source. For more information, visit www.usepropane.com.